This simple radio for Cinnamon. Require moc player. In setting you may add, edit and remove stations. This simple radio for Cinnamon with editable list of stations. Require moc player. Special thanks for the improvements and translation NikoKrause (https://github.com/NikoKrause). Now you can control the volume with the mouse wheel, and also mark the stations that are to be shown in the list. Symbolic icon added. Now the icon is correctly displayed in the panel. nice little app, works well. users need to get the direct steaming link, for soma, look on the left margin for direct stream links, choose the quality link you want and load that. seems to work for me no problems. Doesn't seem to play streaming playlist files (such as those from http://somafm.com) which are used to procide multiple URLs for a stream. If I enter a playlist file, it should call mocp -p to play the first stream location in the playlist. Remove any exstension for the link, and the station will work. The radio is perfect the way it is. I think (1) radio should NOT include listings of urls because radio stations constantly change, 1day they online, next day they non-exsist. Many change op hours. (2) It would be a real mess and very time consuming to the creator to keep a valid list of some current online radio streams. (3) It would be hard to please everyone with his selection if he added a list, because his rock or chill or pop or rap or whatever streams may not be yours. Then it be a hassle to delete his streams and start all over with yours (4) it is best to leave blank, so we can add the streams we like and want to hear. The three streams that is listed currently, only 2 worked for me. but that okay, because it is a good way to set an example of how to add or delete. Thank you for the effort of creating the app. Icon.png use in list of widget, not in applet. Applet use function set icon from cinnamon library (this - 'radio'). I'm happy to make a grouping of stations, if there is an option in the API to add an editable list of choices. The name of the icon inside the applet's js file does not match the actual filename of the icon (icon.png). This makes the applet invisible in the panel. Please, fix! 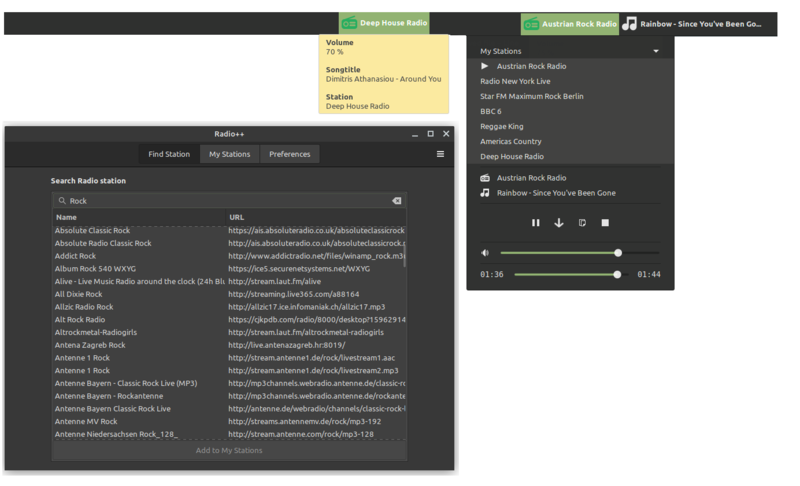 It would also be cool to support grouping of radio stations via submenus. Программа хорошая, но хочется свои радио добавить. Forgot to mention, it Didn't work at first, but only after I had downloaded Moc player via synaptic package manager, it worked immediately, and was easy to configure with new stations. Excellent application, EASY to use, thanks a lot. In order to add stations, I chose them fro Icecast radio directory in VLC media player, hit the info choice on right mouse click, then copy "Location" contents (a web address? ), right click the Radio++, chose config, click + to add a station, name it and paste the location. You're done. NikoKrause, thank's for your improvements.